（Many people) think / say / feel / believe that………. It is true to say that……. It can also be said that……. It goes without saying that……. 【Many people】 think / say / feel / believe that + nature is disappearing from our cities. It is true to say that + nature is disappearing from our cities. It can also be said that + nature is disappearing from our cities. Needless to say nature is disappearing from our cities. It is clear that + nature is disappearing from our cities. It goes without saying that + nature is disappearing from our cities. Not only + is nature disappearing from our cities + but also……. 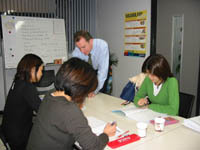 Copyright (C) 2006　英会話を新宿で学ぼうどっとこむ All Rights Reserved.